The first Saturday of October has been and gone, which means that daylight savings has been established, which is very welcome despite the risk of faded curtains. This means better beertography and (generally) warmer trips home. Illiards and I snuck the first trip in last night, but this evening we have a seriously good beer on which to do the full BotF treatment, which means beertography AND an in situ review. 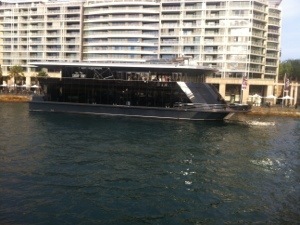 Firstly, how ugly is this boat? This correspondent is not a surfer. Bodysurfer, yes, but not a surfer, which makes me less qualified than other correspondents like illiards and oompaloompa to do this review. They are both long boarders of regular pursuit and today’s beer proclaims itself to be the “Boardriders (sic) Beer”. 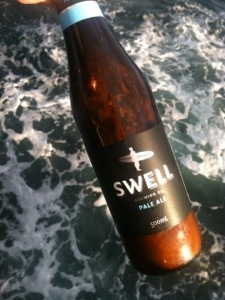 Swell Brewing Company is yet another example of a winemaker making beer, indeed another South Australian winemaker making beer. If it taste this good, then more of it I say. I think they produce 4 varieties, and tonight we are having the Pale Ale. To mangle a surfing analogy, this is 6 foot and glassy ie big and smooth without completely hammering you. 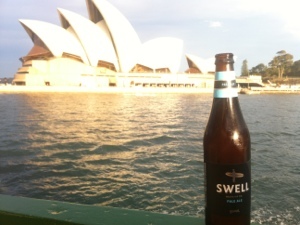 If ever a beer was more appropriate for drinking between the Sydney Heads on the Manly Ferry, I haven’t seen it.